Add CSS rules manually in Style Editor to build professionally looking pages. 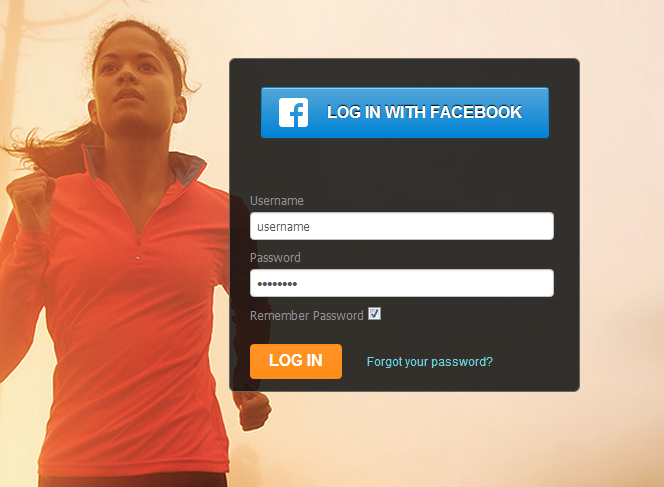 Take a look at this customized login page: page background, input controls and Facebook button appearance were adjusted via CSS rules added in Style Editor. Click this image to open sample app in browser. 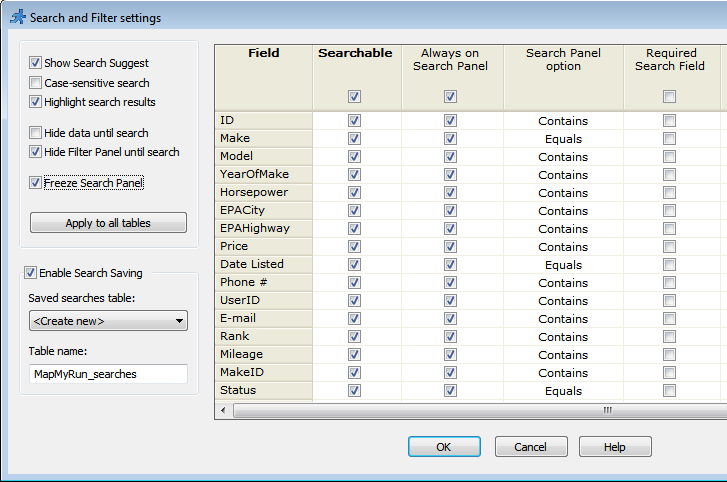 Similar to search panel filters provide instant feedback on numbers of records matching each criteria. You can select multiple criteria or multiple intervals for each filter. Feel free to play with this live demo. In this demo filters are Manufacturer, Car type, Horsepower range and Transmission type. 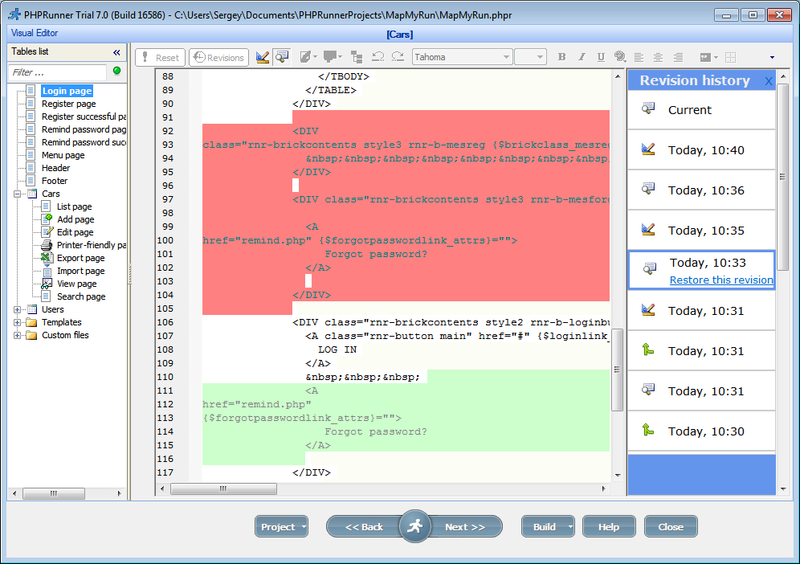 Track all changes made in Visual Editor, review and restore any revision. Red areas show what was deleted, green areas show what were added. New search options - do not show any data before search, required search fields (i.e. 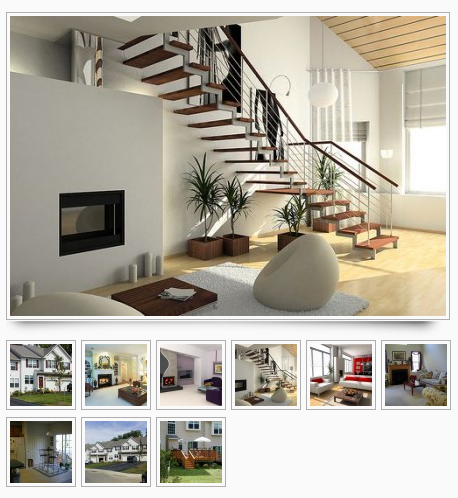 homes for sale database, do not allow to show any data until zip code is selected). Lookup wizard enhancements - all lookup wizard types can be both master and dependent controls now including list of check boxes, radio-buttons, multiselect list box etc. 'Prevent duplicate data' option (find this option under 'Edit as' settings). Sergey, you’ve blown me away with this new preview! Awesome! Seeing some really nice improvements. Especially on the Menu and Login parts but the search filters can also become real handy. Thanks for your great product and keep up the good work. Looking forward to this new version! I just installed PHP 7.0 and the system is not opened for testing. Informed me that my time had expired and I only have the option to purchase. These changes in the new version of PHPRunner, I find the best. It is very good. Congratulations and keep going. Will these features work on Mobile pages also? The ASPRunner 8.0 changed the way you upload the files, or remains the same without components (BinaryRead)? The processing speed improved? That is if questions were worked I’ll be interested in purchasing. WOW!!! impressive. I can’t wait to upgrade. I saw the examples, fabulous! Is it functional for mobile? Is the sample library installed on his computer (cars, …) is exploitable? Where can I buy it and at what cost to PHPRunner 7? Awesome! The direct CSS editing in style editor is a great improvement over having to insert our own custom snippets to override styles on pages. The rest of the features are also great new additions. Would also be nice to enable code custom pages to be searched as well via the PHPR universal search currently in the events tab (seems to only search native phpr pages). Simply great efforts by whole team. Great Product. I would suggest to have more enhancements on visual editor part and also few click to apply same customized on add, edit, view and print once add is customized in visual editor. Mobile version should also be upgraded. Looks great anxious to work through the preview. Great ,glad to hear that. I have updated my phprunner license for about 2 months ago (update get 1 free gift). Must I pay new license update for phprunner 7? Every day PHPRunner is better! CCS is a genial and necesary complement! What will the upgrade prices be? I own PHPRunner 6.x Enterprise. This is great work, thanks for the ongoing efforts to improve this great product. – how to upgrade PHPRunner6.2 version to the new upcomming version 7 before planned Price increase ? I did all the tricks I open ports 8085-8090 manually, I stoped the antivirus, I stoped the windows firewall, I reinstall the software but Still not Functioning.. I wounder if this is related to installing the new version it seems to be so .. Outstanding! The search highlight feature by itself is worth the price of the upgrade. Waiting for the new release… any ETA? Can’t wait for this! Fantastic. I especially like the new menu and search defaults. Will definitely go! Worth to have it!! Waiting PhpRunner new version !!!! Hey any dates on the new version? Hello, for when we have the pleasure of meeting our new version of PHPRunner? You have done whatever was required and good for the system. It was second to nothing. I highly appreciate your efforts of you and your team to see phprunner as a product. But the only thing I repent since past so many years (since I am using phprunner 5.3 build 7474) that report part was requested as a feature request. The reporting is not powerful as required. I have given example of reporting feature of oracle. You can check any version of oracle since forms 6i and you will come to know what I want to say about reporting part and how it should be done. I know it is a bit difficult, but not impossible. I am very much sure, if the reporting is done like oracle reports, no product will ever stand in front of phprunner/asprunner in next 10 years to come. I can bet on this. Please review and make it a note on feature request, which I had been requesting over for past few years. So far so good as a web based system, but if you could improve reporting like oracle reports, I can bet that the end users will be able to make a decent ERP system on phprunner/asprunner. Hello, since this preview published, almost daily checking for the new version ..
every year the new version appear in October ..
when we see the new realse ? any date ? PHPR. Top, Top product. Encompassing this is the support you get from the forums. As a package you simply cannot fault and I always look forward to the enhancements. Awesome! Will 7 work with all the templates, quiz, calendar, invoice, etc., that I purchased or will I need to wait for an upgrade on those? Thanks and again, great work! awesome, good work… Keep ‘ em coming. Thanks a lot!! Php runner was and still the best! Save so much time and is so simple. Developpers must have! excellent, very exciting. Already have many published projects.. I assume mobile plugin is part of the upgrade? And is there now a way to more easily edit the re-direct script. We want to redirect by screen size rather than just by mobile devise script. As now most tablets support the desktop version…thanks Guys the best! Will there be any changes regarding SQLite? Especially a connection via PDO would be a great improvement, since the actual type of DB connection makes it useless on most hosting providers I know of, since it connects to the old version 2 of SQLite. Sergey, a honest suggestion, can you make a tie up with jasperreport.com ? your system will have no limits then, it is a open source reporting system. Please give it a thought.